Explore Milan's surroundings by going to Bergamo (La Citta Alta & Basilica di Santa Maria Maggiore). There's still lots to do: pause for some serene contemplation at Duomo di Milano, admire the masterpieces at Pinacoteca Ambrosiana, browse the different shops at Galleria Vittorio Emanuele II, and admire the landmark architecture of Chiesa di San Maurizio al Monastero Maggiore. To see more things to do, maps, where to stay, and more tourist information, use the Milan attractions tool . Bologna to Milan is an approximately 1.5-hour train ride. You can also drive; or take a bus. In February, daily temperatures in Milan can reach 10°C, while at night they dip to 1°C. Finish your sightseeing early on the 16th (Sat) so you can drive to Bellagio. 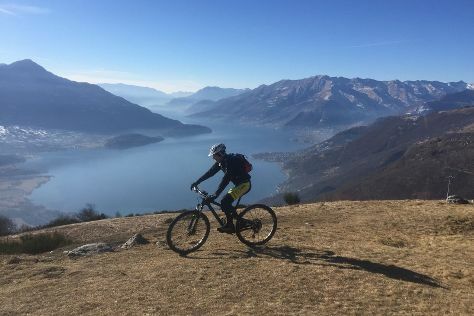 You'll find plenty of places to visit near Bellagio: Santuario Madonna delle Lacrime (in Dongo), Anything But Work (in Mandello del Lario) and Tremezzina (Villa del Balbianello, Chiesa di S. Bartolomeo, & more). There's lots more to do: pause for some serene contemplation at Santuario Della Madonna delle Grazie di San Martino, admire the verdant scenery at Valchiavenna, look for gifts at Profumeria Bellagio, and take in the awesome beauty at Monte Grona. To see where to stay, maps, more things to do, and more tourist information, you can read our Bellagio online trip itinerary maker . Drive from Milan to Bellagio in 1.5 hours. Alternatively, you can take a train; or do a combination of train and bus. In February, daily temperatures in Bellagio can reach 10°C, while at night they dip to 0°C. Finish up your sightseeing early on the 20th (Wed) so you can go by car to Brescia. As the second largest city in Lombardy after Milan, Brescia has served as an important hub of commerce and culture since pre-Roman times. Get out of town with these interesting Brescia side-trips: Cathedral of Cremona (in Cremona), Sirmione (Rocca Scaligera di Sirmione & Grotte di Catullo) and Il Vittoriale degli Italiani (in Gardone Riviera). There's lots more to do: don't miss a visit to Brescia Underground, browse the different shops at ELNOS Shopping, pause for some serene contemplation at Duomo Vecchio di Brescia, and contemplate in the serene atmosphere at Chiesa di San Gaetano. To see ratings, photos, traveler tips, and more tourist information, refer to the Brescia online tour itinerary planner . You can drive from Bellagio to Brescia in 2 hours. Other options are to take a train; or take a bus. Expect a daytime high around 10°C in February, and nighttime lows around 1°C. Finish your sightseeing early on the 23rd (Sat) to allow enough time to drive to Mantua. Often overlooked in favor of nearby Lake Garda, Mantua is one of northern Italy's Renaissance gems. Explore the numerous day-trip ideas around Mantua: Museo Civico di Canneto sull'Oglio (in Canneto sull'Oglio), Isola Dovarese (Chiesa di San Nicolo & La Casa Contadina Padana) and Chiesa di Sant'Andrea (in Asola). There's much more to do: admire the landmark architecture of Palazzo Ducale Mantova, contemplate in the serene atmosphere at Basilica di Sant'Andrea di Mantova, delve into the distant past at Rotonda di San Lorenzo, and do a tasting at Malavasi. To see more things to do, ratings, reviews, and other tourist information, go to the Mantua trip planner . Traveling by car from Brescia to Mantua takes 1.5 hours. Alternatively, you can take a train; or take a bus. In February, daily temperatures in Mantua can reach 11°C, while at night they dip to 2°C. Finish your sightseeing early on the 26th (Tue) so you can take a train back home.